Another famous Ipoh snack has got to be the Peanut Candy (or Peanut Brittle for the atas English) at Ming Yue Confectionery. It’s one of the top MUST-HAVE snacks while you’re on an Ipoh Food Trip. 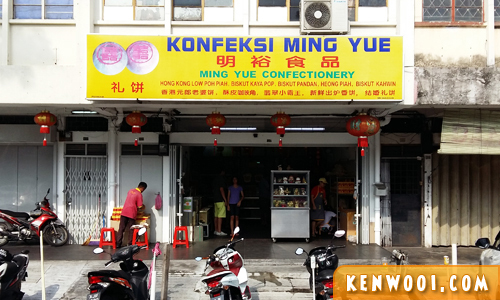 Ming Yue Confectionery is located in Pasir Pinji, where the famous Ipoh Big Tree Foot at. Ming Yue Confectionery is well-known for its fragrant peanut candy and there’s usually a long queue for it. You have to be really early to avoid the long wait. 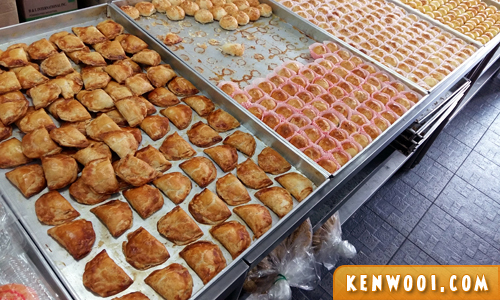 The production frequency is usually every 30-45 minutes for 2 large bags of freshly baked candies. If you’re waiting behind a customer who’s going to purchase in bulk, you’ll most likely have to wait for the next batch. Here’s how the glorious peanut candy look like! 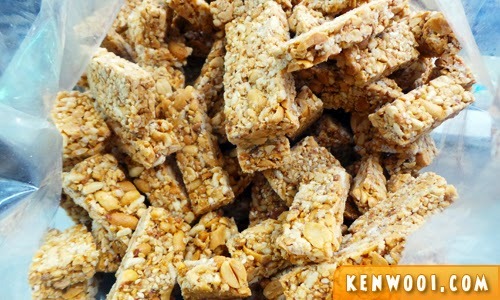 Its crunchy texture is quite addictive. The peanut candy is sold in multiples of 100 grams. 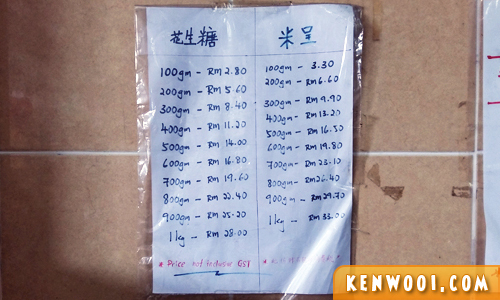 The price is listed on the left of the photo below – RM2.80 for every 100 gram. 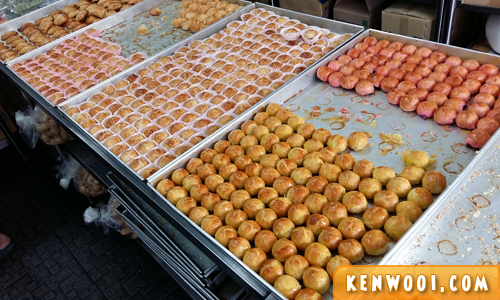 Besides the peanut candy, there are other pastries and confectioneries available, such as kaya puff, mooncakes (only available during Mooncake Festival), salted egg puff and many more. As for the kaya puff, Sin Eng Heong would be my preferred option. yes…i love the peanut candy here and also their wedding biscuits. Their biscuits with the salted egg yolk inside also very good. Would love to try them all. Most important to have a local in the know for the best in the city. Otherwise, will end up buying at the malls, usually all not nice at all. Don’t know what they call those small round biscuits which come in assorted flavours of lotus paste, read bean and pandan with yolk. They are baked fresh from the oven and taste great especially when they are consumed on the same day they were made. Don’t keep them for too long as the biscuits will lose the freshness after about 4 to 5 days although they can still last up to 2 weeks. Highly recommended for fresh and mild (not too sweet) tasting biscuits, and most importantly the prices are very reasonable when compared to other more “boutique” biscuit shops such as Guan Heong whereby the biscuits usually come in nice wrapping individually wrapped. On the other hand, Ming Yue produces “no frills” biscuits without any individual wrapping at a very down-to-earth price. Most importantly they are delicious. Oh, before I forget, you can drop by Tuck Kee restaurant just opposite the road to have some nice noodles or rice dishes. One of the oldest air-conditioned restaurants in town. Further up the road is the famous “Tai Shue Kiok” (Big Tree restaurant). Over here you can find the smoothest and best bean curd where you will not be able to find anywhere in KL or Malaysia. Only in Ipoh.